I love the big stitches on this beautiful quilt! This is so cool! I love seeing pictures of it! Oh, Patty, it’s just gorgeous! I don’t have a hand quilting project set up right now, having just finished one last month. I’d let it sit for a long time before picking it up to finally finish, and didn’t realize how much I had missed it! Perhaps if I put together a small quilt, I could have it completed before my November migration. I’m out of girl baby quilts....hmmmm....you are inspiring me with this beautifully designed creation! What a fabulous job you are doing on this quilt! 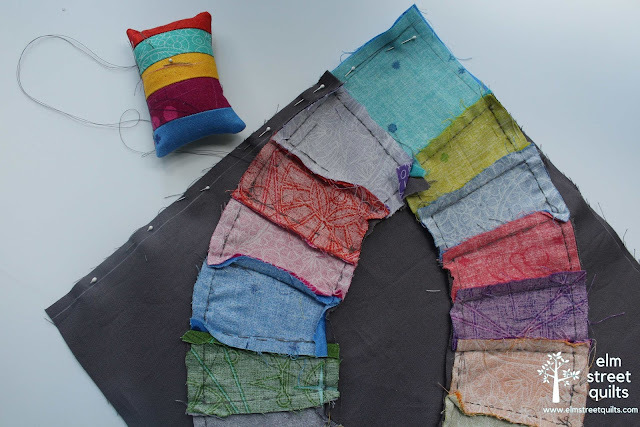 What a great quilting idea! Love the effect, inside the rings, and the ghost rings! 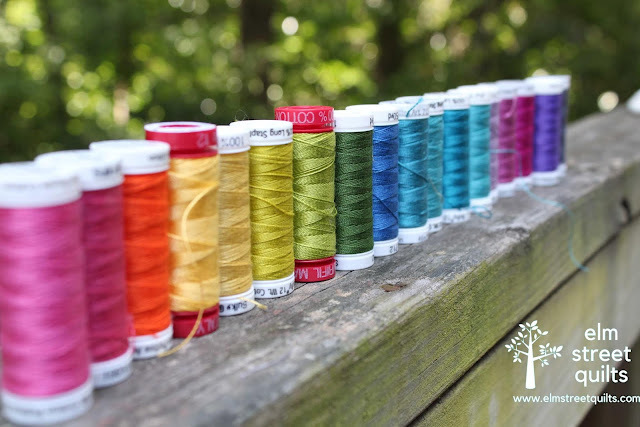 Are you really changing threads with each different color? Wow! That's dedication! Oh, wow, this is coming along well. The photo of the lovely threads is bringing a smile to my face too. Bold and bright! You've made a lot of progress. Good luck with your stitching plans for October. This is absolutely beautiful, Patty! I do love the effect you have achieved with the hand quilting and admire you for doing that!! I've only hand-quilted (and hand stitched everything but the borders) one small wall hanging - my first quilt class - and decided that would likely be my last!! I can see where you would want this one hand quilted though! Great job! That is just lovely. Modern traditionalism at its absolute finest. You rick. Still admiring and loving this quilt so much. Hand quilting, well, mine never looks good. Yours is always excellent. The hand quilting is beautiful, I love the texture it is adding to the background. This is a stunning piece, and the quilting is perfection! Way to go! Such a striking quilt! It's going to be a show stopper. Negative space! Love it! Nice quilting and piecing. You are much braver than I to tackle all that hand quilting. But I'm sure you'll enjoy every stitch!